The markets speak, revealing to some degree, the aggregate expectations of all investors. 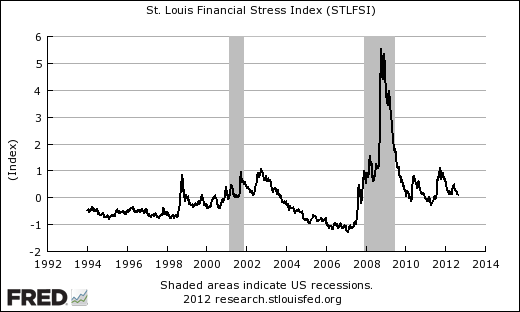 The St. Louis Fed generates the “Financial Stress” index on a monthly basis. It is comprised of 18 bond, stock and other metrics, to see how much “stress” the US financial system is under. Here is the data as of August 24, 2012. The level of stress is way down from the time of the 2008-2009 stock market crash, but still at elevated levels seen in late 2007 just prior to the 2008 crash. The stress level is also significantly lower than at the time of the heightened eruptions of European credit market fears in 2010 and 2011 — apparently less worried, or perhaps just accepting the problem as a chronic one that will be eventually managed over a period of years. We think the measure signals that things are better, maybe sort of OK, but not yet comfortable. The Chicago Fed National Activity Index is a coincident indicator based on 85 economic factors drawn from four broad categories of data: production and income; employment, unemployment, and hours; personal consumption and housing; and sales, orders, and inventories. The derived index provides a single, summary measure of a factor common to these national economic data. 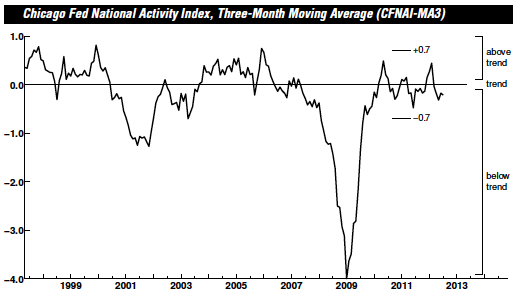 When the CFNAI-MA3 value moves below –0.70 following a period of economic expansion, there is an increasing likelihood that a recession has begun. Conversely,when the CFNAI-MA3 value moves above –0.70 following a period of economic contraction, there is an increasing likelihood that a recession has ended. When the CFNAI-MA3 value moves above +0.70 more than two years into an economic expansion, there is an increasing likelihood that a period of sustained increasing inflation has begun. The United States is growing at a below trend rate, but not close to a recession at this time. This entry was posted on Tuesday, September 4th, 2012 at 10:53 PM and is filed under Data. You can follow any responses to this entry through the RSS 2.0 feed. Both comments and pings are currently closed.